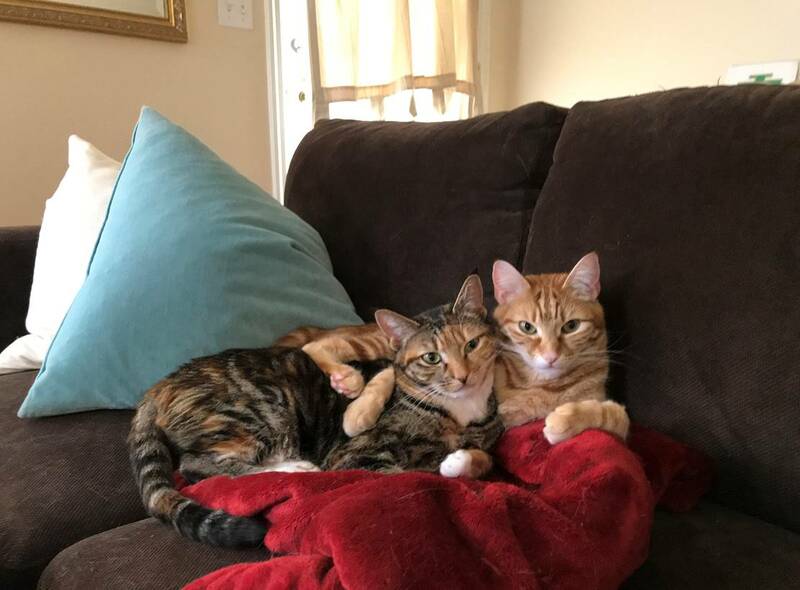 We are Rory (M orange tabby) and Tabitha (F Torbie). We are adorable, healthy, bonded siblings about 19 months old. Our current owner cannot keep us due to family allergies. We are friendly, social, indoor cats with access to a catio. We are both curious and playful though Rory is a bit braver and Tabitha a bit more shy. We greet strangers who come to the door and like to get to know who you are. Rory often asks to be held, for a moment, and usually sleeps on his blanket. Tabitha is a little wary of being picked up but once she is settled will snuggle and sleep on your lap. They often sleep together and will groom each other and share food. Neither scratches furniture or sprays. They are used to playing with toys, chasing bugs and do not bite or claw during play. Because they currently share one litter box, it is cleaned up twice per day. They have not spent time around young children or other animals. They are neutered/spayed and current on all vaccinations, including rabies and they are microchipped. They have frequent visits to the vet for nail trims and have been receiving monthly topical flea treatment.